The stock market is finally beginning to show signs that the bull market may be coming to an end. Before I go into the stock market though, I want to discuss the dollar because I think currencies are going to be integrally tied to the topping process. For the better part of the past five years a lower dollar has generally been positive for the stock market. However, we are now five years into QE and I think we are at the point where it's important that the dollar hold its value. At this point I think the stock market is deathly afraid that the dollar is going to crack under five years of continual debasement. As many of you have probably noticed, over the last several weeks stocks have been dropping along with the dollar. We have some interesting currents at play in the currency markets at the moment. It's been my opinion for some time that the dollar would adjust its yearly cycle low from the spring to later in the fall (this will set up next year's yearly and three-year cycle low to occur late in the year. This is also the most likely time frame for the currency crisis to occur). I think that process is now in play. 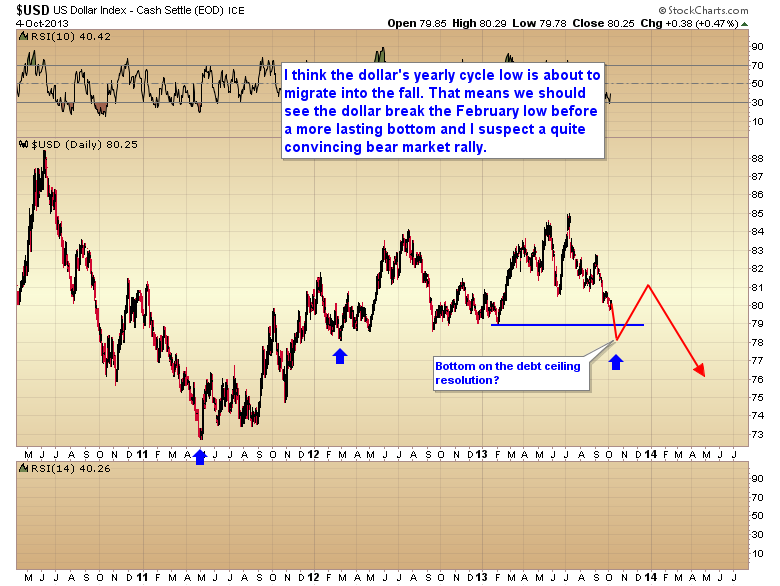 For this to come to fruition the dollar needs to move below the February low sometime in the next two or three weeks. Keep in mind that other than a three year cycle low the yearly cycle low is the most intense sell off of the year and generally does not terminate until it looks like the world is coming to an end (we definitely haven't reached that point yet). I suspect the government shutdown and debt ceiling debacle are going to intensify the dollar’s yearly cycle low this year. This suggests that we are going to see a very aggressive and scary decline in the U.S. Dollar Index over the next 2-3 weeks. I'm expecting the yearly cycle to bottom either on the debt ceiling resolution, or one day either side of it as the market starts to sniff out a deal. At that point I think we're probably going to see a significant intermediate degree rally as the currency markets breathe a sigh of relief.